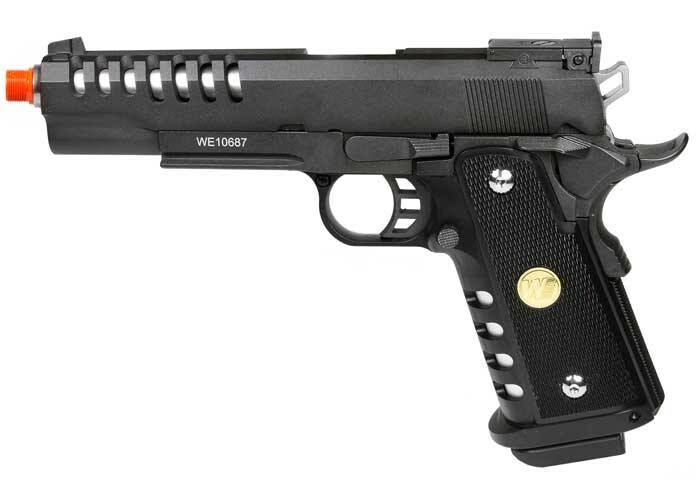 Things I liked: WE always makes a high quality pistol, and this is no exception. With both a skeletal slide and hand grip, this pistol will make a very unique addition to my collection. Things I would have changed: There are a few things I will upgrade, just so I can get the performance just right. other than that, having a chrono, and seeing it run 350-360 on Green Gas, I wont have to do much. Things I liked: The gun has a really good kick back to it, feels real. Made of good metal and feels heavy. Things I would have changed: I would change the quality of the parts used to put together for a longer lasting gun. What others should know: Cons: Has thumb safety on both sides, right side safety fell off after only having it for a week. Good thing I'm right handed and I undo the safety with my left thumb. Also grip safety has come loose and pops out. Could be made with better quality. I would save up some more money and buy something better. Things I liked: At $60.00 this gun is a steal! Got it during that week's doorbuster deal. Very accurate, economical (30 shots per magazine load) and very realistic looks and feel. Heavy! Adjustable rear sights. Even the grip safety works! Truly an amazing gun. Things I would have changed: Nothing. Oh one suggestion: a small white dot in the front sight and two white dots in the rear sight for faster alignment. What others should know: I got another WE Hi-Capa from another website and I used CO2 magazine. Fired close to 1,000 rounds with CO2 and Green Gas magazines, now that gun won't fire with Green Gas. I guess the CO2 magazine damaged the internals.